From the “New York Times” bestselling author of “Blackberry Winter “and “The Violets of March” comes a gripping, poignant novel about the kind of love that never lets go, and the heart s capacity to remember. While enjoying a romantic candlelit dinner with her fiance, Ryan, at one of Seattle s chicest restaurants, Kailey Crane can t believe her good fortune: She has a great job as a writer for the “Herald” and is now engaged to a guy who is perfect in nearly every way. As they leave the restaurant, Kailey spies a thin, bearded homeless man on the sidewalk. She approaches him to offer up her bag of leftovers, and is stunned when their eyes meet, then stricken to her very core: The man is the love of her life, Cade McAllister. When Kailey met Cade ten years ago, their attraction was immediate and intense everything connected and felt” right.” But it all ended suddenly, leaving Kailey devastated. Now the poor soul on the street is a faded version of her former beloved: His weathered and weary face is as handsome as Kailey remembers, but his mind has suffered in the intervening years. Over the next few weeks, Kailey helps Cade begin to piece his life together, something she initially keeps from Ryan. As she revisits her long-ago relationship, Kailey realizes that she must decide exactly what and whom she wants. 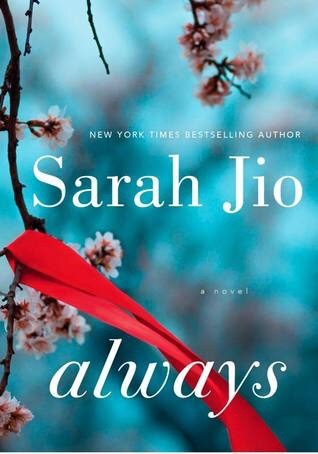 Alternating between the past and the present, “Always” is a beautifully unfolding exploration of a woman faced with an impossible choice, a woman who discovers what she s willing to save and what she will sacrifice for true love. I have been a fan of Sarah Jio forever. Her books have a little of everything plus, they are immensely entertaining. This one made me want to throw the book across the room. Or better yet, jump up and down on it and then dunk it in water. I guess it is a sign of a good writer which can elicit this kind of response from a reader. May not be exactly what the author went about to achieve. But, success is sucesss, I guess. Cade and Kailey were very much in love. Then he just up and disappears. Kailey has searched for him to no avail. She decides to move on with her life and she becomes engaged to be married to a great guy. She and her fiancé are leaving a restaurant one evening and she sees a homeless man sitting on the sidewalk. Kailey realizes it is Cade. This sets off a turn of events which change both of their lives forever. Kailey is a character which frustrated the devil out of me. She cannot tell the truth for the life of her. If she has such a great fiancé, he will understand about Cade…and she just keeps lying. I just want to pinch her head off. And her fiancé….don’t get me started on his weak little self. Characters aside, there are some great aspects to this book. I enjoyed the setting of Seattle. And all the music references are truly amazing. Took a lot of research to nail some of those. I will say the plot in this book just sort of died toward the end. Almost like the author was trying to hurry up and finish. This sounds like a harsh review but I did enjoy the book. I could not get Cade and his deterioration out of my mind. I still can’t. Like I said earlier….sign of a good author. I am getting ready to start reading this book. Great review! I’ve enjoyed Jio’s other books, and I think I will add this to my TBR. I find it interesting that you wanted to throw the book across the room, but liked it enough to give it four stars. It sounds like the author was playing with your mind. I agree! The main character just frustrated the crap out of me! !